One of the biggest annoyances of iOS is the impossibility to easily backup and restore application data to the cloud, without being forced to keep an app installed to not lose everything. This is particularly true for games: not only your Angry Birds record is always at risk of being erased because you might accidentally delete the app from your device or iTunes, there's also no way to keep data synced between apps running on different devices. For example, it'd be nice to start playing Angry Birds on the iPhone and automatically continue the session (with the same data) on the iPad, or, why not, simply restore data and other settings with one tap from the Internet. This is one of the features Apple is rumored to be working on for the major revamp of MobileMe dubbed iCloud, and while it'd make perfect sense to let gamers restore data using Game Center, a wider implementation of backups and restores across the whole Apple cloud would be certainly more appealing to iPhone and iPad users. Several hacks in the past months allowed users to extract app data from non-jailbroken devices and back it up to a local computer. These solutions, however, didn't provide the dead-simple approach of DataDeposit, a free app available in Cydia that backs up your app data to Dropbox, and even allows you to restore it with a single tap from your device, using the cloud. 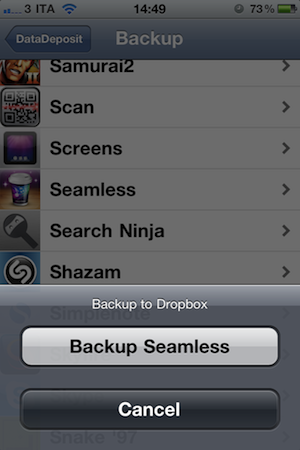 Once installed, DataDeposit will look into your iOS Applications folder to see apps that can be backed up to Dropbox. This list includes apps installed from the App Store, not the system ones. More specifically, not an entire app will be backed up, just its saved data for your app specific settings and progress -- like Angry Birds records or a 1Password local database. Once you hit Backup, DataDeposit will create a "DataDepositApp" folder in your Dropbox, with sub-folders inside it containing .zip archives of data. If you only use your iPhone, you won't see any of this by default -- just a progress bar and a confirmation dialog. When you want to restore, make sure the app is closed, hit Restore and wait for DataDeposit to move the data from the cloud to your device again. I tested this personally and it worked really well: I backed up my Angry Birds data and uninstalled the app; I installed the app again, made sure I had no progress in the game, then restored using DataDeposit. All my completed levels and stars were there, in a matter of seconds. DataDeposit is free in Cydia, works great with Dropbox and it's very easy to use. If you've been looking for a way to seamlessly backup your app data but you didn't want to use a manual method, DataDeposit deserves a try.